Here we go again, full moon followers! Leo and Aquarius is the Match of The Day this month around- with an almost or weak eclipse (in view of aspect, not effect)! The Sun is sitting proudly in Leo, its home sign. The Lion is at his peak- a strong summer, proudly showing the mane and outgoing and playful. The Moon moves into Aquarius, oh my days. Lunar Aquarius is the polar opposite. 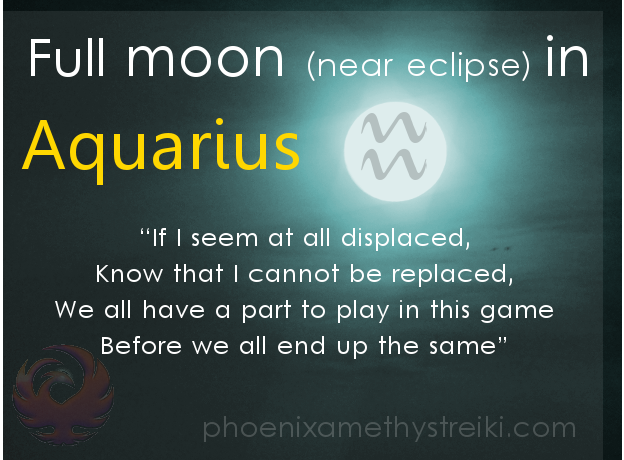 The Aquarian Moon is unpredictable energy- a changeling, a destroyer, a transformer. Aquarius is driven by both Saturn and the Uranus- a challenging combination of logic, reason and rebellion! These qualities stir the Moon’s emotions at this time. It’s the teetering spark between chaos and genius. Leo does not like this, Leo likes to be in charge. It is the King after all, no one should forget this. The unknowing can hurt Leo’s pride, as can the lack of control. But of course, this is not all bad news, sorry Leo. Leo wants to be seen to be the one doing it all and Aquarius wants everyone to join in. Leo is the self-expression, the character, this individual. Aquarius is the connection with others (in a different way to Libra), the friendships and working relationships are important- Aquarians love being part of the community, where Leo loves being the head of a community. The Moon is giving that need for connection to others. In the mix of things, Mercury is tearing through the shadow patch in Virgo before going retrograde at the end of the month (oh yes indeed, another mercury messenger challenge). Mercury is currently conjunct Jupiter -a friendly optimism for the full moon, so will keep it positive. Venus and Jupiter are both also in Virgo, Mars is charging through the sky in Sagittarius with Saturn, Neptune is in Pisces and Pluto is still in Capricorn (which it is in until around 2022). It is all building- and the aspects are here to help this full moon transmutation! There is an Arrow Yod- Headed by Venus, Jupiter and Mercury in Virgo, on the other side we have the moon in Aquarius, Chiron (the wounded healer) in the middle and flanked by Uranus in Aries. Yods are often seen as karmic lessons and with Chiron in the middle of the arrow and Venus at the head, in innocent Virgo. This points to a time of moving on into the higher ground. You’ve been where you are- step up! You have special help at this time. If you feel in to it, looking at your karmic past may help bring up the healing you are looking for now in the present. Venus is trine Pluto – Pluto is there to help transmute the love, the abundance. To open up the possibilities of your heart (once again). And then there’s the continuing Mutable T-square with Venus Saturn and Neptune. The moon was helping Saturn around a week ago and is now on its way to conjuncting with Neptune. So, what does this mean for the full moon then? I feel that the full moon challenge, that lasts around the three day halo of a full moon is to pay attention to any new relationships and discoveries over this time. There is the potential for great things to happen here, especially if you are a Leo, or, have an Aquarian moon. We may want to hide, as our pride may feel a little dented, if we meet people who are “better than us” as something we like or want to do. Remember, that is the trick of the ego. We may here things we don’t want to hear from people. Remember that they may be speaking their truth, they may be trying to help you. There are always different angles to perceive things from and this time is no exception. Be objective, be receptive, proud Lions! Enjoy this full moon, keep on looking to the stars. Keep on believing. Previous Uncover your lost Chakra!